What would it feel like to be up close to the world’s tallest mountain? To see the sun’s rays light up its craggy edges? Wouldn’t it be a moment you consider as an achievement for a lifetime? No matter where you go, this adventure would stand out as a solid bucket list item ticked off. But anyone who considers Everest Base Camp trek seriously will encounter a few queries; such as am I fit enough to do it? How costly will it be? Is it too dangerous? How many days do I need to complete this trek? Can I do it solo or would I need a porter and a guide? Obviously, the list goes on but with this travel guide, I hope to address all such curiosities. I recently completed this trek myself so this travel guide is also a travelogue completely based on my own experience. How do you prepare for trekking to Everest Base Camp is really a vast topic so I will be breaking this information in a series of articles. I will run through each aspect of the trek and cover it in a comprehensive manner; including details on my own journey and also things that I would have done differently if I had prior knowledge. The image above is of Gorakshep (also spelled as Gorak shep) which is the last stop before Everest Base Camp. This entire region, in fact, is a frozen lake-bed covered with sand. At an altitude of 5,164 meters(16,942 ft), this small settlement serves as a much-needed stop for trekkers going towards Everest Base Camp. When we say Everest Base Camp, we are really talking about two camps and not just one. Mt.Everest, at an altitude of 8,848meters / 29,029ft, is on the Nepal – China border. The boundary between the two nations passes through the summit and hence, the mountain has two base camps, north and south. The North Base Camp is in Tibet at an altitude of 5,150 meters (16,900 ft); and the South Base Camp is in Nepal at 5,364 meters (17,598 ft). Both of these camps are very basic campsites that get used by mountain climbers during their ascent and descent while climbing Mount Everest; either via southeast ridge or the northeast ridge. The north camp can even be accessed by vehicles (at least in the summer months), unlike its equal down south. The South Base camp is deep within the Sagarmatha National Park of Solukhumbu district in Nepal. There is no vehicular access here. One has to either fly in (helicopter) or trek all the way. Supplies are brought to the camp by Sherpas or porters with the help of animals, which usually are yaks. 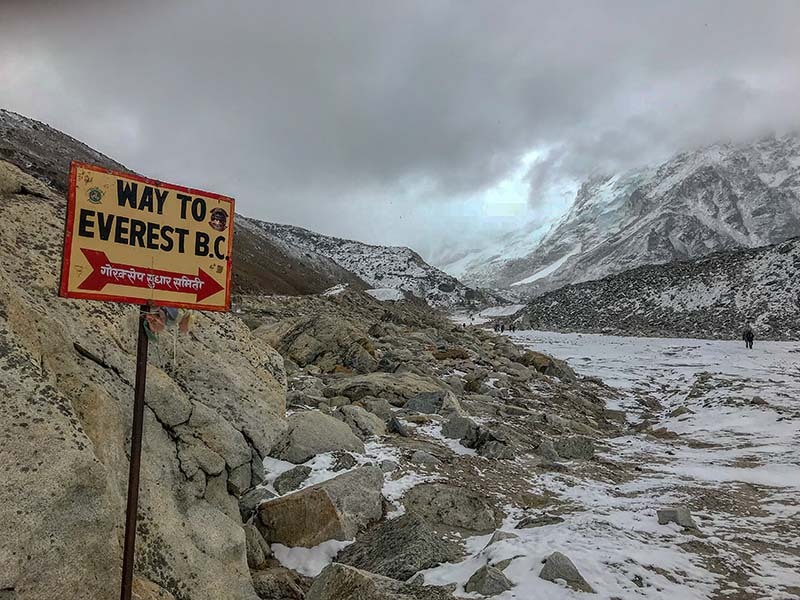 For all intentions and purposes, henceforth, “Everest Base Camp (EBC) trek” refers to a two-week journey from the hustle and bustle of Kathmandu (1,400 meters/4,600ft) all the way up to the South Base Camp of Mt. Everest (5,365m/17,600ft) including the climb to Kalapathar peak (5,545m/18,192ft) to view the tallest mountain in the world up close and of course, the journey back down to Kathmandu. The image below is en route a climb to Kalapathar peak, as the sun comes up behind Mt.Everest. Trekking to Everest Base Camp is by no means a walk in the park. It is not impossible either. It is a fortnight of you away from your comfort zone. This is not your average fun trip with friends where you party it up. This is more of you exploring yourself in the company of Himalayan giants. It is a perfect time to start or quit certain habits and addictions. Do you want to stay off social media for two weeks? Have you been thinking about quitting to smoke? Do you want to meditate or reflect? I doubt anything else could be a better choice as the daily rigors of this trek and the absolutely stunning views keep your mind always full and you, always blown away. This trek is the pinnacle of Himalayan majesty; and the best way to experience it is to walk among nature and observe the changes in the environment in a phased manner. Picture this; you land in a crowded city (Kathmandu), you fly to Lukla, and you enter the peace and quiet Sherpa country. You see lush greenery; and you leave the tree line at Namche. You walk through rhododendrons; you see peaks that touch the sky as you are transported to the alpine world of rocks, snow, and ice. All along you hear the wind, you hear the calming yak bells and of course your breath. For me, this was no less than meditation. In a nutshell, you land at Kathmandu, take a flight to Lukla, from where you walk all the way to EBC taking 9 -10 days up and 3 days back down including acclimatization days at Namche and Dingboche. But before we proceed to the day to day account of the actual trek there are certain logistical details that need attention. These details, if taken care of, will ensure that your trek becomes easier, safer and you’ll know what to expect at each leg of your journey. In the next series of articles, following are some of the topics that I will be covering. Once we cover these, we will move on to the actual travelogue of trekking to EBC. I shall also include alternative routes/detours as well as options for people who do not have more than a week, to just see Mt.Everest from far and return rather than completing the whole circuit. There are two important aspects that affect your progress on this trek; your fitness and altitude. Let us focus on fitness now; I shall cover altitude and acclimatization later. While I was doing my research on the trek I came across multiple articles where people say one needs to start preparing months before the trek. If this trek is a trigger to kick-start your fitness regime, then it’s perfect to give it a go a few months in advance. Most of us in India are pretty under-fit when it comes to cardiovascular endurance. This didn’t seem the case with most westerners who came for the trek. On most days they’d be up earlier than me and would have set off long before I even woke up. Most would cover distances at a faster rate than me. But we have to take into consideration that they do a lot of hiking and cycling as part of their routine activities unlike us in India where it’s mostly always too hot to be outdoors. Work-life balance is better off in most Western countries as compared to India. I could not shrug off the fact that the two weeks were a break from my routine as an Emergency doctor that involved running on timelines to do my shifts at the hospital. So I used to take it easy when it came to waking up and setting off. After all, it is a holiday! So what does one need to do to be considered fit for this trek? The way I experienced it, anybody who can walk, can do this trek. It is just hiking. There is no technical section, no climbing and no use of ropes. It is just one long walk that takes several days and involves certain areas where you need to tread carefully. 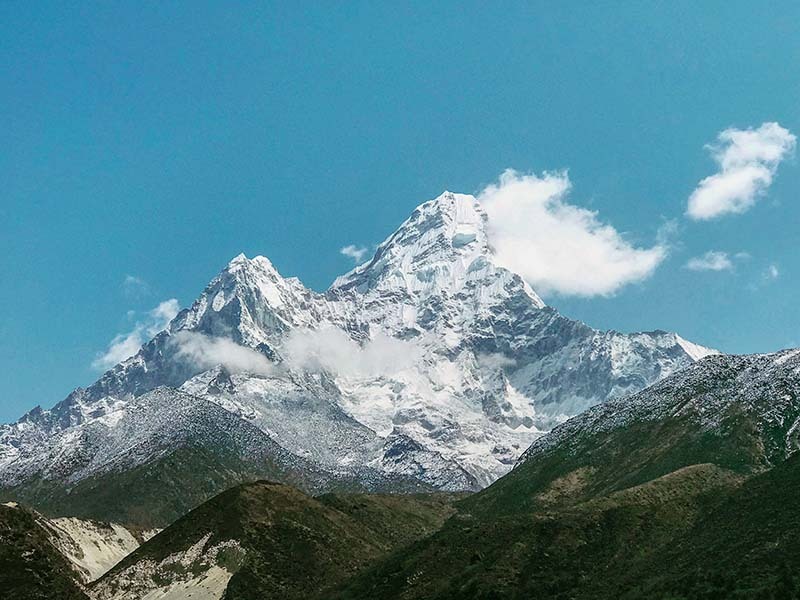 So if you can walk normally around your house without any support or difficulty, you can walk to Everest Base Camp and see the tallest mountain on the planet, it’s as simple as that. When I was close to the base camp at over 5,000 meters above sea level, I even saw an elderly paraplegic drag himself up with his crutches! How’s that for some solid inspiration? In my case, I barely trained. I could push some okay-ish weights in the gym but I think my cardiovascular fitness is abominable. I don’t like jogging. But I did spend a month prior to the trek, trying to improve my fitness. I did try jogging and brisk walking for around 30-40 minutes on most mornings. Another great exercise is stair climbing as it mimics the leg movements of a trek. Try it with a small bag with a couple of liters of water or a few books in it, go up a few flights of stairs? You should feel breathless and your heart rate goes up. Get used to it, that’s the whole EBC trek for you. This trek was my first high altitude trek. Many say try other smaller treks etc prior to this. Maybe, if you want to see whether trekking is really your thing. But those treks don’t have Mount Everest at the end of it to keep you going. I had done multiple Himalayan trips before and I have this undying love for the mountains. Since 2 years I had this trek on my mind and when I got my chance I went for it. So what is the ideal fitness level needed for this trek? If you can cover 5 kilometers within 30 – 35 minutes you’re pretty good. It can be a combination of jogging and brisk walking that you do to finally cover the distance of 5 kilometers, but that’s a fair target. If you are taking more than an hour for 5 km, than you need some training else you will need to prolong the trek as you may find it difficult to keep up to the itinerary that most people follow. To sum up, the fitter you are, the more likely you are to finish the trek in 12-13 days. If you are not that fit/can not walk at a basic pace then you will need to prolong the trip. If you are a hypertensive/diabetic, make sure that your parameters are in good control before you undertake this trek. Consult your physician before you plan this. Newly diagnosed diabetics who have just been put on medication may want to put off the trip before they get to a stage where their sugar levels are well under control. I would recommend all heart patients and patients with prior stroke history to avoid this trek due to the obvious risks involved. I cannot put my finger on any specific age group as you can be fit at 70 and unfit at 30 as well (age is just a number). In the next part of this series, I will continue sharing my knowledge about how you can best prepare to undertake the exciting and thrilling task of completing the Everest Base Camp Trek. If you have any questions; or need any other details; please feel free to ask in the comments section below; or at our Community Forum; and I will be glad to answer.